I love a hearty breakfast! Particularly on a cold day, a warm breakfast just kicks things off on the right note. 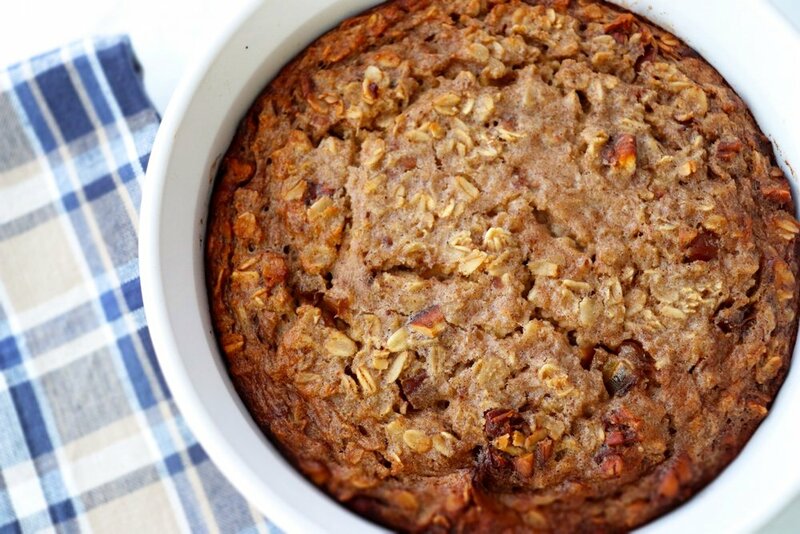 I've got several oatmeal recipes on the website (Chunky Monkey Overnight Oats, Banana Bread Oatmeal and Peaches and Cream Overnight Oats) but no baked oatmeal recipes. For Sugar-Free January I'm experimenting with using fruit as a natural sweetener in recipes in place of refined sugar and a baked oatmeal recipe was the perfect place to start! This recipe is based off one I saw on Salted Plains. That recipe was vegan and since I don't follow a vegan diet (I love eggs, and milk!) I made a few changes to it. 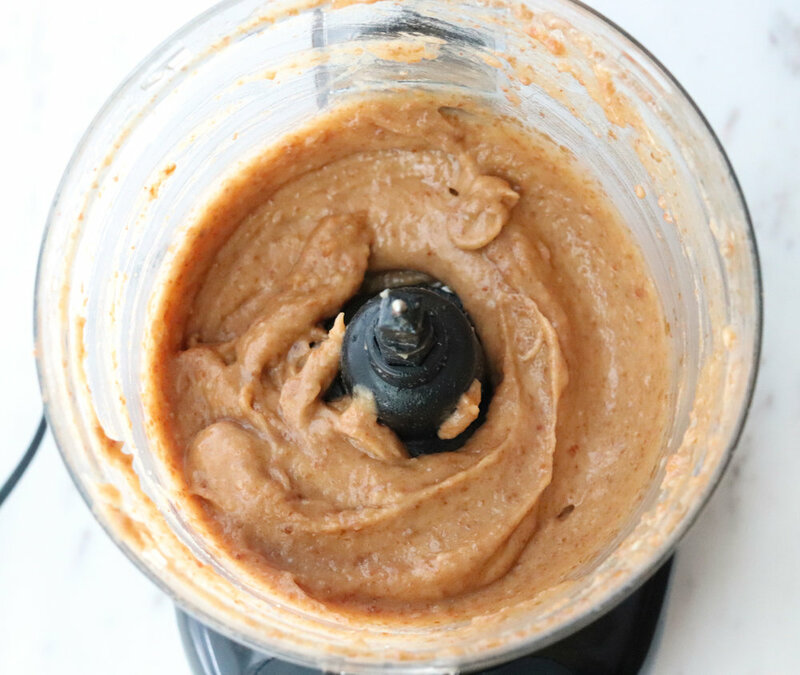 The sweetener portion of the recipe comes from date paste - or as I like to call it, date butter (just sounds more appetizing than date "paste" don't you think??). I actually doubled the amount of ingredients called for in the vanilla date butter portion of the recipe below and have plans to use it in some other recipes coming up. It keeps well covered, in the refrigerator, up to a month. Oats are high in fiber, especially soluble fiber. Oats contain more soluble fiber than other grains, leading to slower digestion and an increased feeling of fullness. This is a "stick-to-your-ribs" breakfast that will definitely hold hunger at bay until lunch! Another bonus is that it is good warm or cold, but I'm definitely going for the warm foods right now in these frigid temps! Preheat oven to 375 degrees Fahrenheit. Spray a casserole dish (11x7 or 2 quart) with non-stick spray. Make the date butter: place the dates and hot water in a container with a lid and set aside for at least 15 minutes to soak (or can let soak overnight at room temperature, covered). Combine the dates, liquid and vanilla in a blender or food processor. Process until smooth, scraping down the sides as needed. In a medium bowl combine the oats, salt, baking powder and cinnamon. Stir to combine. In another medium bowl combine the eggs, milk, canola oil, vanilla and vanilla date butter. Whisk to combine. Pour over the oat mixture and gently stir. Fold in the chopped pecans and dates. *Remaining vanilla date butter can be refrigerated for up to a month, covered.